B&H has put together this Impact EX100 Two-Monolight Kit with Stands and Case for photographers who need a basic kit with solid features that is road-ready. The kit includes two 100-watt/second monolights, 8" reflectors, PC cords, 24 x 24" softboxes, and 8' air-cushioned light stands. A padded kit bag with handles and a shoulder strap is also included. The Impact One-Monolight Kit (120 VAC) is an economical 100-watt/second monolight with modeling light and power variator. 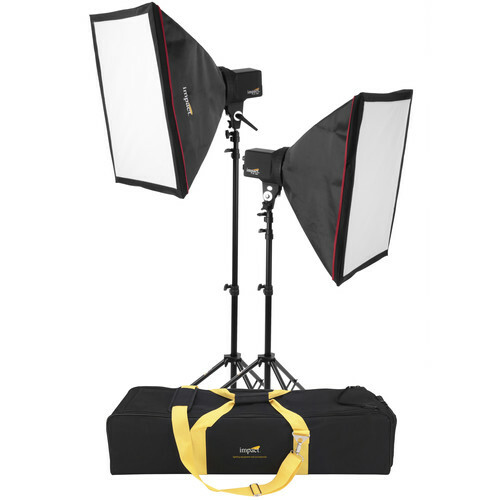 This kit includes a softbox with mounting ring, to soften the light output. The included 24 x 24" softbox has a silver interior for crisper highlights. PC sync cord with monoplug is included. Line sync voltage is only 4.3 VDC (safe for any camera's circuitry). Box Dimensions (LxWxH) 23.2 x 9.5 x 7.3"
Does this kit come with bulbs included? Yes, this kit would include flashtubes and modeling lamps for each head.